My parents came up to help us out a little as we prepare to move. 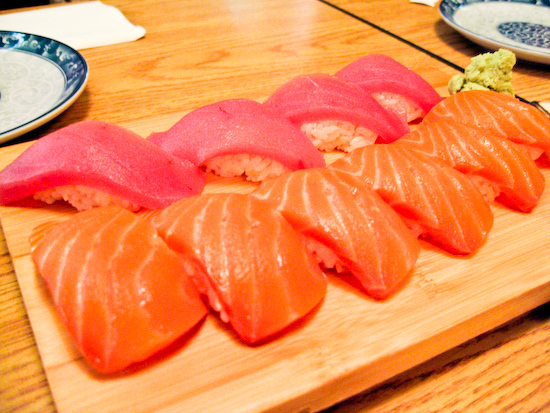 We all went out to dinner and I felt like sushi, so we went to Truya Sushi (3431 El Camino Real, Santa Clara, CA‎ - (408) 244-4534‎). Tina and I shared some nigiri (sake [salmon] and maguro [tuna]) as well as some edamame, seaweed salad, and an unagi tataki appetizer. Cliff and I walked over to South Beach Cafe. 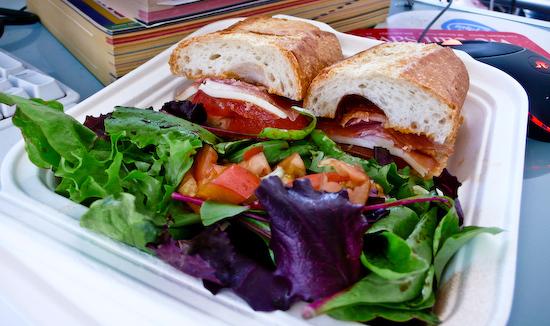 I had a Prosciutto Sandwich which I enjoyed. The salad accompanying it was particularly good today. For dinner, I convinced Tina to let me get a Pizza Hut Tuscani Lasagna. The reason I did this was because at Fanpop we were discussing the Pizza Hut commercial where Pizza Hut supposedly rigged hidden cameras in a restaurant in Rome and had lasagna served that had been made by Pizza Hut. 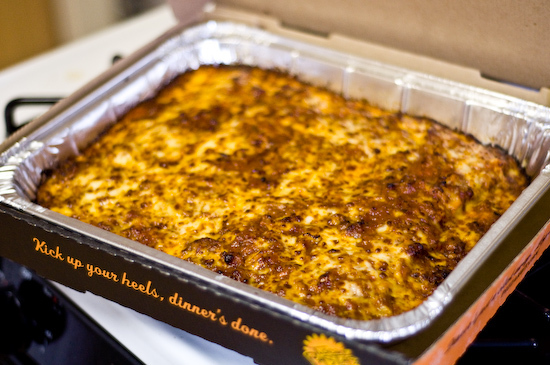 The patrons loved the lasagna going as far as to claim it tasted just like their mother's recipe! There's NO WAY. American meat lasagnas, although very tasty, are so incredibly different from the types served in Italy, no Italian would ever say it was like the ones their mother used to make. Pizza Hut went as far as to produce a Behind the Scenes making of video to "prove" that it was real. Maybe it was, but certainly it had to be a different recipe with different ingredients. I was grumpy today. I had scheduled my going away get-together for this afternoon and we had to run around getting some stuff to prepare for it and I just wasn't in the mood for it since both Tina and I had some work to do in the morning. 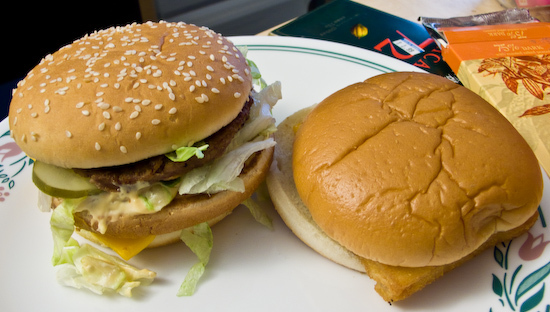 Pressed for time, we grabbed lunch from McDonald's - I got a Big Mac and a Filet-o-Fish. Those of you who know me personally have probably heard my complaints about Filet-o-Fish sandwich making. The between the bottom bun and the fried fish patty is a slice of cheese. This cheese effectively glues the sponge bread to the fish. 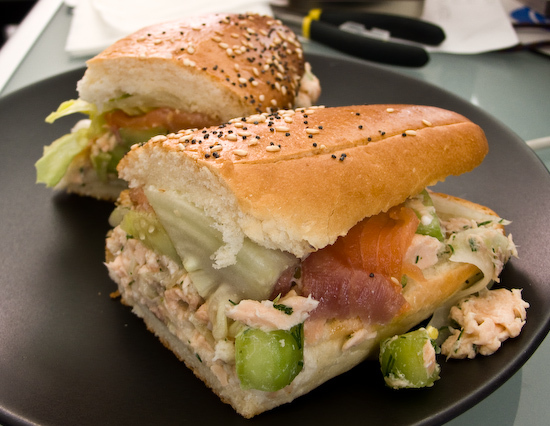 If placed off center, the sandwich is lopsided and cannot be corrected without destroying the bottom bun (which is spongy and relatively delicate). 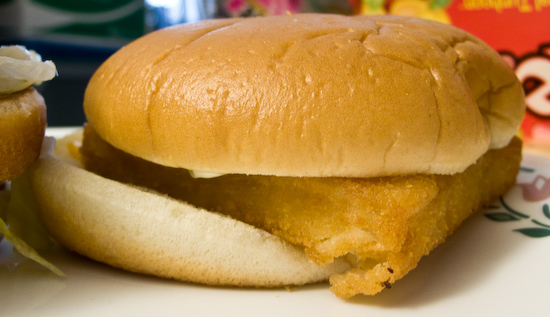 In the last five years, I have not had a Filet-o-Fish where the patty has been placed squarely on the bottom bun. How difficult is this task? Why can't someone just do it right for once? I got up early today and took Harold to CQB City in Stockton, California (currently my favorite place to play Airsoft). After playing a couple games, we broke off to eat grilled hamburgers for lunch. The hamburgers tasted different than what I was used to because they used some red colored seasoning (didn't catch the name) as well as a healthy dash of Lea & Perrins Worcestershire Sauce. There's nothing like a lot of exercise and an coming off an insane amount of adrenaline coursing through the body to make a burger taste great. 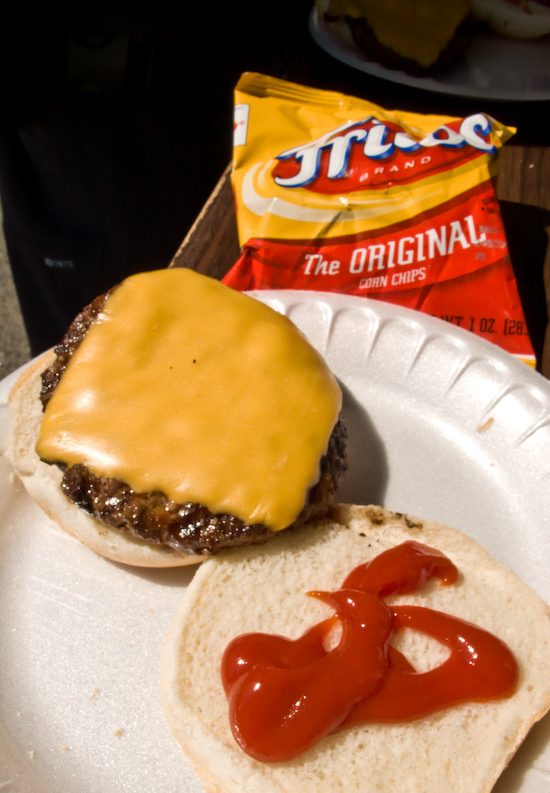 I had a Pepsi and a bag of Frito's Corn Chips with the burger. 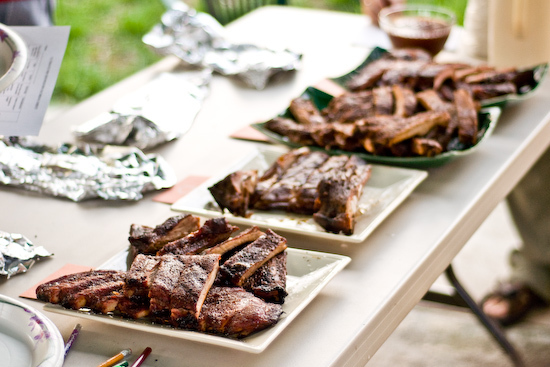 After coming back from Airsoft, Tina and I headed over to Nate & Annie's home to participate in a barbecue rib taste test where we sampled four different ribs (one purchased from a local BBQ restaurant and the other three prepared in different ways - grilled, boiled then baked, and smoked). 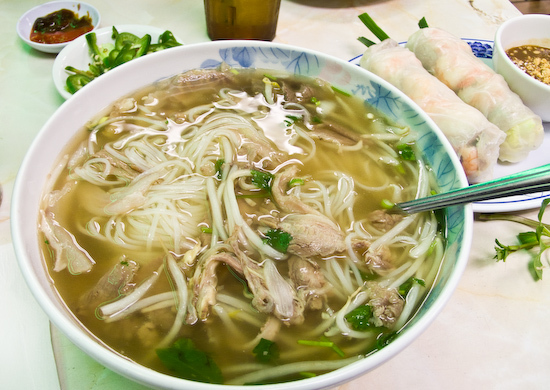 Today pretty much concludes my rapid fire tour of the famous dining places in the Bay Area. For lunch, I ended up eating at Charlie's (named after Charlie Ayers - see Calafia from a couple weeks back), the main cafeteria on Google's Mountain View campus. 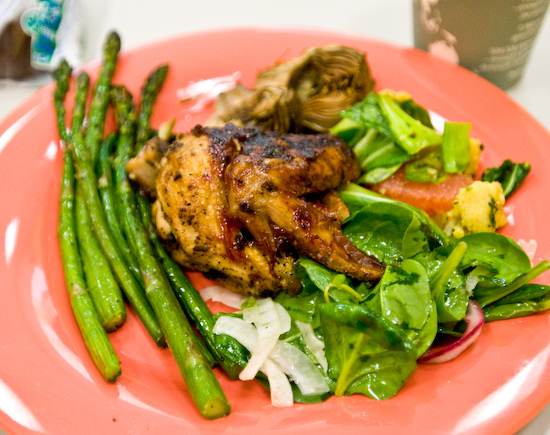 I grabbed some perfectly cooked tender asparagus, barbecue chicken, baby artichokes (which were a little undercooked) and a nice fresh greens, fennel and citrus salad. 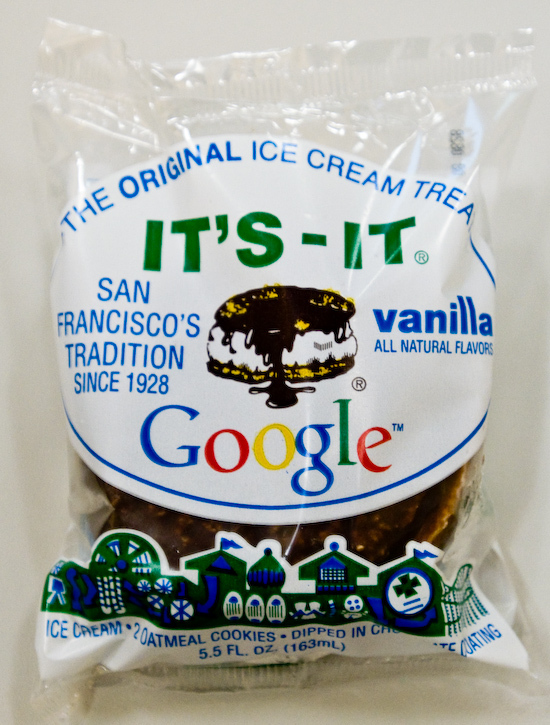 I also had a Google-branded It's-It for dessert. In the evening we headed up to Berkeley to dine at Chez Panisse (which many consider to be the birthplace of California cuisine). 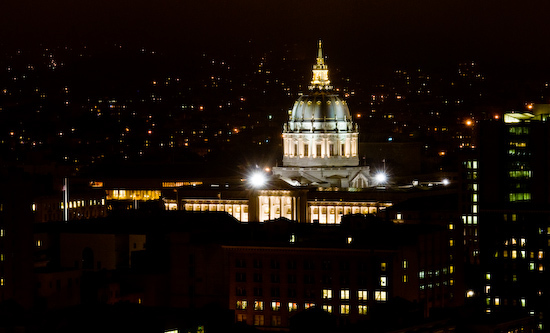 I've been living in the Bay Area since 1995 and always meant to dine there, but never made the time. Since, I'm moving to Austin in a couple weeks, I made sure I'd eat at Chez Panisse before leaving. The meals at this Michelin 1-star are set (everyone in the restaurant eats the same four course meal which costs $95 per person on Fridays and Saturdays). 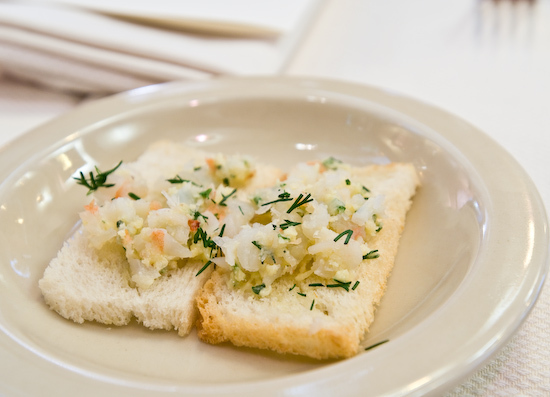 An amuse bouche of crab and dill salad served on what looked like and tasted like melba toast started us off. The team walked over to Crossroads Cafe today to pick up lunch. 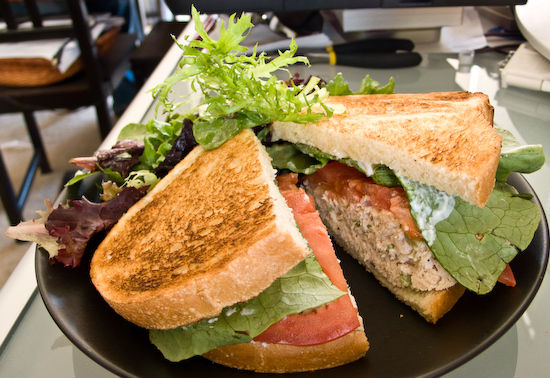 I grabbed a Cold Tuna Sandwich with Salad. 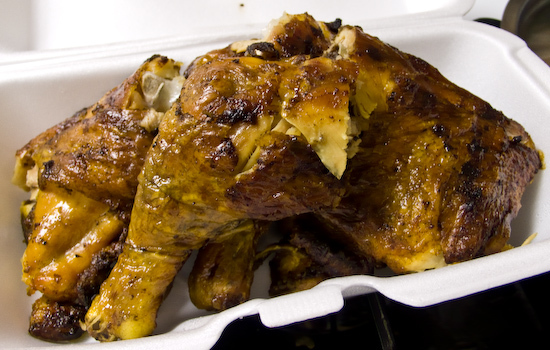 For dinner, we just had our leftover El Pollo Loco Chicken and Cole Slaw. 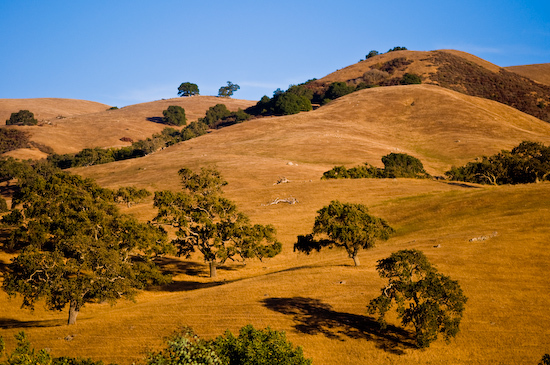 I promise tomorrow's food will be better - I'm hitting the last of my Bay Area Fine Dining Death March - Chez Panisse. Harold and I met up for a quick lunch at Lee's Sandwiches which serves Vietnamese sandwiches. 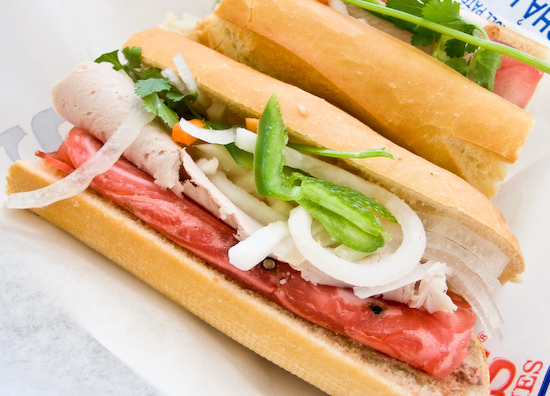 I got the Special Combination (#11) which has Vietnamese cold cuts, pate, cilantro, pickled carrots and daikon, and jalapenos. I didn't get a chance to eat dinner until almost 11pm because of my (last) homeowner's association meeting and dealing with a few things in my home that needed fixing (doors that needed to be sanded down, etc.). 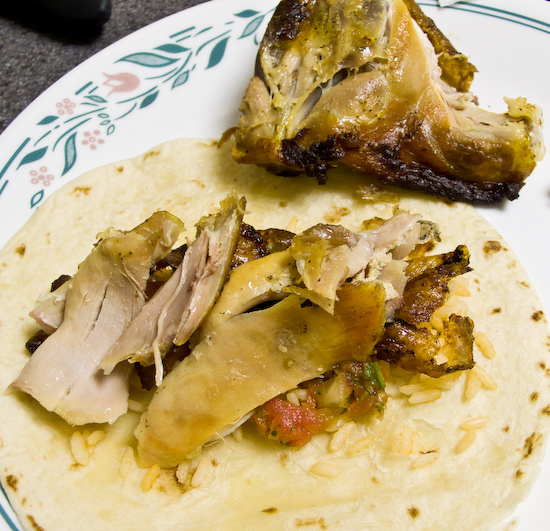 Tina and I drove over to El Pollo Loco and we got a six piece legs and thighs meal and used a coupon for a free chicken carnitas burrito (a new product). At lunchtime, Papa and I walked over to the Ferry Building so I could buy some fresh fruits (a pommelo, two grapefruits, and three navel oranges). We were going to grab a couple burgers at Taylors, but the line was too long so we grabbed a burger from the Prather Ranch BBQ at the Farmer's Market. I usually get the cheeseburger or the buffalo burger (which they were out of), but today they had a special lamb burger stuffed with mozzarella cheese. I had that and it was pretty good. 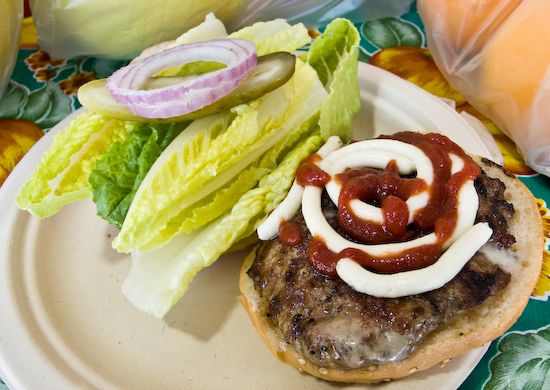 If you like the taste of mild lamb, you'll like this burger. Tina and I decided to eat pho tonight, so we went to Pho Thanh Long Restaurant (2450 El Camino Real, Santa Clara, CA‎ - (408) 983-0888‎).